Maybe it’s spring. Maybe it’s Spring Break. Whether the season is the reason, it’s a lighter, brighter weekend full of bouncy fun. Go ahead, put on your shorts and pretend the weather is different from the rest of the year in L.A.
Improv Olympic West may be the Stanford U. of improv comedy but starting tonight, the alma mater of comedic kings and queens like Tina Fey, Jon Favreau, Mike Meyers, Adam McKay, Amy Poehler and about a zillion others will celebrate the comedic written word with the 1st Annual Los Angeles Scripted Comedy Festival: four days of sketch, solo, variety, storytelling, stand up, podcasts and short films. Unsure just what some of those things are? There are two days of workshops, with comedy notables such as SNL vet Cindy Caponero and late night guru Doug Karo, to not only help you figure it out, but help you do it better. In addition to a schedule jam-packed with crack-you-up comedy shows, there are five late night competitions to tickle your funny bone into the wee hours: Stand Up, 24 hour Sketch, Storytelling, Video Shorts and Sketch Cage Match. Note: the latter is not as dirty as it sounds. 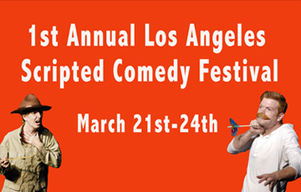 1st ANNUAL SCRIPTED COMEDY FESTIVAL — Thurs, March 21 – Sun, March 24; $5 – $25; Note: Main Stage shows are 21+— ioWest, 6366 Hollywood Blvd, LA 90028. 323.962.7560; For sked: http://ioimprov.com/west/scriptedfestival/ Note: A percentage of all festival show & workshop revenue will be donated to the Chris Farley House: a state-certified residential treatment program for recovering men and women in Madison, Wisconsin. Go Go’ers, there’s no better way to learn your letters than at Friday night’s hot-as-a-pistol show that kicks off the 2013 tour of The Accordion Babes Revue featuring six sirens of the squawk box who have a pin-up calendar to prove their prowess at primping as well as squeezing. Not that they won’t prove both in person…. 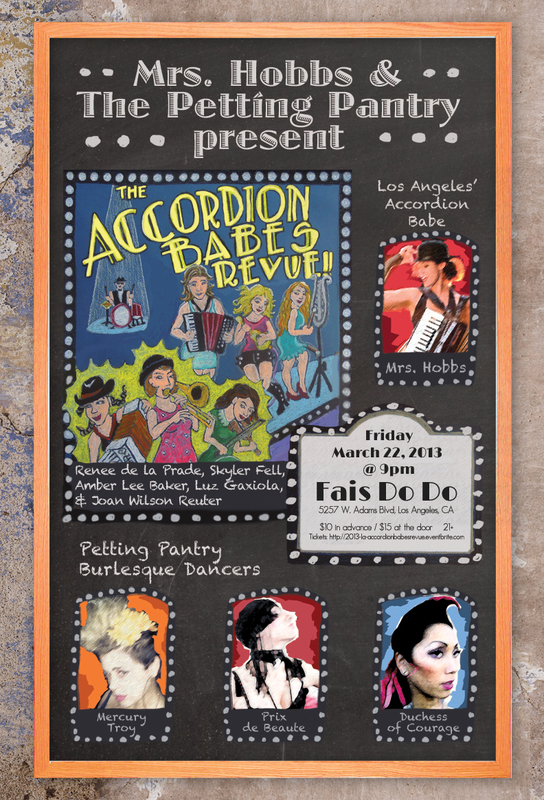 Presented by fellow accordionista Mrs. Hobbs & The Petting Pantry — the fierce burlesque troupe helping to heat up Fais DoDo on Friday night — the evening will be MC’ed by curvaceous clown Luz Gaxiola, founder of the all-girl Circus Finelli. Better add S(izzle), W(iggle) and Y(owza!) to Friday night’s alphabet. Maybe it’s the influence of the imminent Pacific Standard Time’s Modern Architecture in L.A. but these days, the City of Angels seems chock full of large-scale art events like the upcoming Yarn Bombers LA’s Granny Squaring of the Craft and Folk Art Museum. 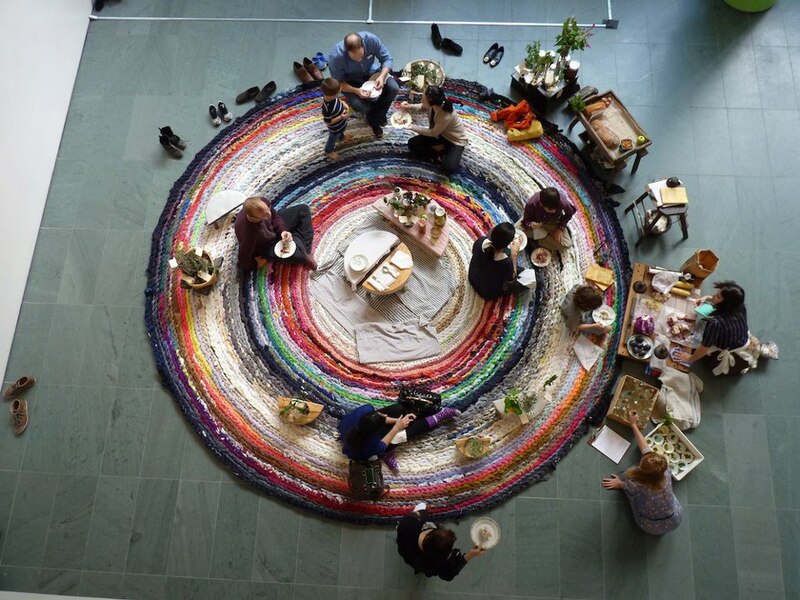 This week’s art-by-community event is the Domestic Integrities rug that artist Fritz Haeg is crocheting out of discarded textiles over four days in the Hammer Museum lobby with the help of volunteers and museum visitors. The rug will continue to grow as it travels to museums in Massachusetts, Minnesota, and San Francisco. Want to participate but can barely find your way around a button? Clean out your closets and bring washed linens, clothes, towels, sheets, etc. to the Hammer on Saturday for the Domestic Integrities-affiliated Seriously Go: Cookies and Crochet. Band of Outsiders/Saving the Season Cookies by AMMO will be served and KCHUNG will be broadcasting all day with appearances by artists, writers, and curators. Saturday is a many splendored thing. SERIOUSLY GO: COOKIES AND CROCHET — Sat, March 23, 11am – 5pm; $5-$10 — Hammer Museum, 10899 Wilshire Blvd, LA 90024 More info here. 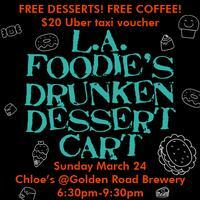 Go Go’ers, it may sound like a deliriously delicious, too-good-to-be-true dream and yet, this Sunday’s Drunken Dessert Cart from L.A. Foodie and Supperclub is oh so real and oh so good. Sweets selections include — but are certainly not limited to — Bon Appetit-recommended Ococoa Chocolates, L.A. Times/KPCC-approved Heart of Tartlets and celeb faves Sweet Spils. Secret Squirrel and LA Coffee Club sling the caffeine and Golden Road Brewery supplies the craftalicious suds. And if you want to get a pic of yourself drunkenly smashing cupcakes in your own or somebody else’s mouth, the L.A. Foodie Photo Booth will be there to capture your special moment. 2) Make your way to the Golden Road Brewery on Sunday. 3) Go through the door to Chloe’s, the secret space inside the beer hall. 4) Once inside, eat sweets, sip beer, swig coffee. Repeat. 5) Leave with your free bag ‘o swag. Hey, that Spring Fever is definitely going around.